This cookie making tool set is designed for people who love to make to DIY cookies and biscuits at home. Biscuit Press Set consists of a decorating gun, 6 nozzles and 16 molds which allows you to make biscuits of various attractive flower patters. 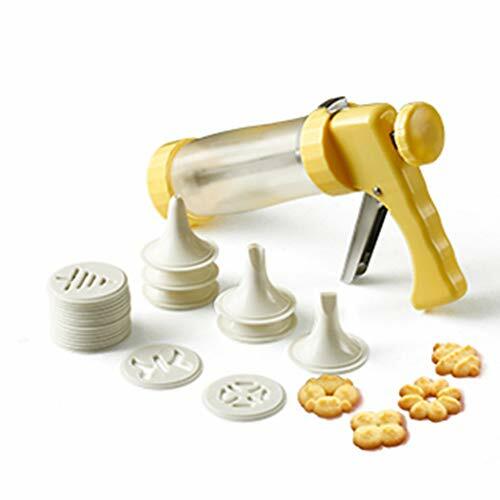 16 sturdy plastic discs in fun shapes of this cookie dough press including holiday shapes such as a wreath, pumpkin, Christmas tree, flowers, and a heart. 6 decorating tips to make unique shapes and designs for easy icing. Perfect for Spritz cookies and cupcakes. It's easy to operate by just pressing it, and then you will get cookies with same size. Don't hesitate to order now, it's completely RISK FREE thanks to our solid gold 100% MONEY BACK GUARANTEE. If you have any questions about this product by KuXun, contact us by completing and submitting the form below. If you are looking for a specif part number, please include it with your message.